Hutton Lodge Pottery, Soulby, Kirkby Stephen, CA17 4PL Tel: 017683 71396 http://www.huttonlodgepottery.co.uk/ Bob March set up the pottery in Soulby in 1994, since when he has been producing pots which are both attractive and practical. As well as making a comprehensive range of domestic ware, special pieces are often commissioned for occasions such as anniversaries or Christenings. Ann Sandell – Artist Ann was born in Greenwich, London and brought up in the countryside of Sussex. She has been in the Kirkby Stephen area for 25 years and plays an active part in local projects, starting the Walkers are Welcome group in 2009. She currently paints local scenes and her popular paintings and craft pieces are on sale in the Kirkby Stephen Visitor Centre. Jenny White-Cooper – Artist Jenny took a Graphic Design course at Art school in London, but was really more interested in drawing and book illustrations. She started making jigsaw puzzles when her children were quite small as a side line to writing. Recently she has been designing cards, mainly semi-botanical flower paintings and local scenes around Kirkby Stephen. Cumbria Wildlife Trust Gifts We’re proud to support Cumbria Wildlife Trust in its work to protect the wildlife and wild places of Cumbria. 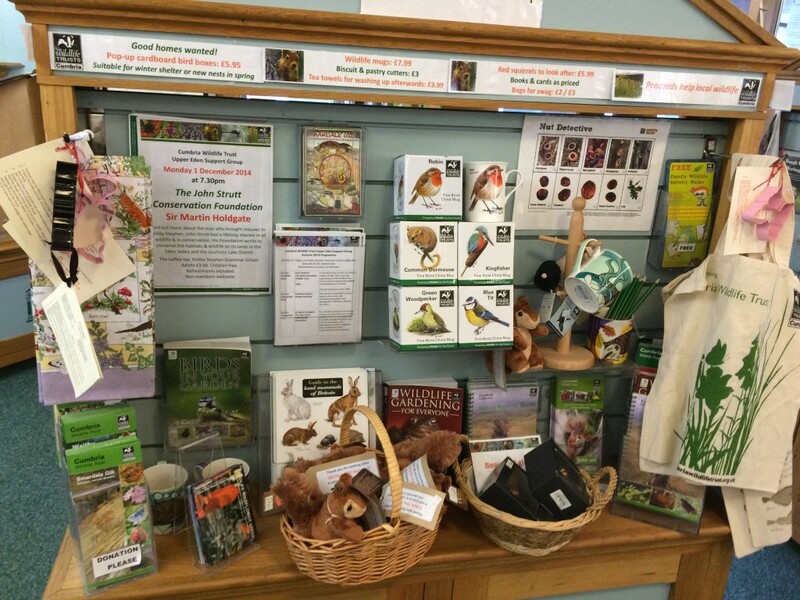 On our stand in the Visitor Centre you can find info about local events and nature reserves such as Smardale Gill, voted one of Britain’s best wild places by readers of The Times. We also have a lovely range of gifts, including red squirrels to take home and look after, biscuit cutters so you can make your own gingerbread squirrels, beautiful wildlife mugs and tea towels to make the washing up more enjoyable! Publications include Field Studies Council wildlife charts and books on birds and wildlife gardening.